Radio Engineering Unit of the Aerospace Defence Forces division located in the Moscow region have received new all-altitude detection radars that will protect the Russian capital from air and space attacks from all four directions. A variety of air surveillance modes allow this radar system to detect all types of aerodynamic and ballistic targets and to simultaneously track up to 100 targets. The aircraft (including those made under Stealth technology), helicopters, drones, cruise missiles and ballistic missiles will be detected in all launch speed ranges and altitudes. Once an enemy weapon appears, the all-altitude detector automatically categorises the target, its state affiliation (system friend or foe) and its coordinates. The obtained information is automatically transmitted to the command post through the cable channel or fiber-optic communication lines. For target detection at extremely low altitudes, under forest and rugged terrain conditions radar antenna device can be raised on a special tower - 966AA14. All-altitude detector can act not only as a means of intelligence, but also as a standalone targeting device. This is the detector's function as part of anti-aircraft missile systems (AAMS) S-400 Triumph, which are in service at air defence missile regiments of Aerospace Defense Forces. 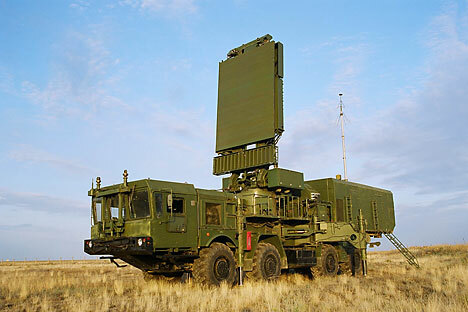 Aerospace Defence Forces already have four of such air defence radars in service, but the process of supplying troops with new radars continues. Most importantly, the modern device will cover Moscow, protecting it from the air and space attacks from all four directions, since besides the government objects, there are also important industrial enterprises in Moscow and the Moscow region. In 2015, the number of new radar equipment coming into service of Air and Missile Defence Command of Aerospace Defense Forces, will be doubled. In addition to the all-altitude detector, the troops will receive the automated control systems and automation equipment complexes of Fundament type, radar stations Podlet-K, training complex Test and others.